The hubs loves black pudding and salads so I tried to think of something different to serve that wasn't too fussy to put together whilst my stuffed mushroom was cooking. Lightly fry the breadcrumbs in olive oil, once nice and golden set aside. Poach the egg in the boiling water, you are looking for a firm white but semi-set yolk, I cooked mine for 5 mins. Cut the bacon into small pieces and fry until slightly crisp, fry the black pudding for 2 mins on each side. Place the salad leaves and tomato on a plate, mix dressing ingredients and drizzle over the top, sprinkle with the fried breadcrumbs, drizzle a little balsamic glaze. 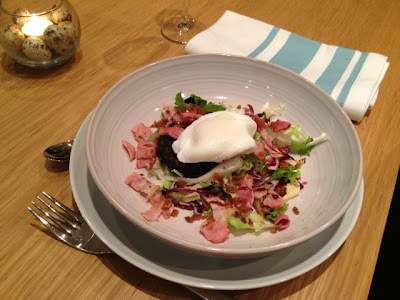 Scatter the bacon round the plate, place the black pudding on top of the salad then add the egg on top of that. I'm assured that this is delicious!!! My pictures don't show tomato as the hubs doesn't like them but if I were to make this for anyone else I'd add them. Pour a glass of prosecco and enjoy.